Canon seems to have returned to top premium compact form with the updated version of its G1 X camera. Although there's no viewfinder built-in, an optional EVF is available if you feel the need. Canon has made some much needed improvements to the G1X Mark II, but it still occupies a slightly strange space. It's a great backup camera to your DSLR, but it won't fit in your pocket. The premium compact camera market used to be pretty much owned by Canon. The much lauded G series was the ultimate in functionality for those that wanted high image quality but didn't want to lug around a heavy DSLR. However, in recent times other manufacturers have overtaken Canon's once unquestionable dominance. The Sony RX100 II is currently the biggest seller in this area of the market, while products like the Fuji X100S offer something a little more unusual. The original Canon G1X, when it was launched, was met with a fair amount of derision. Aside from its good image quality, there were a few problems with it, and it seemed like a niche product without a certain audience. Canon hasn't rushed to replace the camera, but now, after making a series of much needed improvements, the Mark II is here – and it looks exciting and something that could put Canon back at the top of the premium game. The biggest selling point of the G1X was its large, 1.5 inch sensor. It's not too far off APS-C sized and over twice the size of the sensor found in the Sony RX100 II (and the Nikon 1 compact system camera range). It comes as no great surprise therefore that Canon has kept the best part of the camera, redesigning the rest of the package around that. For starters, it has a new lens. It now offers a 5x optical zoom, which is an equivalent of 24-120mm in 35mm terms. More impressively, that zoom range features a maximum aperture of f/2 at the wide end, rising to just f/3.9 at the telephoto end. Canon has also improved the minimum focusing distance, bringing it down to just 5cm – a big improvement from the 30cm minimum focusing distance of the original camera, which was one of its biggest problems. The latest image processor, Digic 6, can be found in the camera. This helps to facilitate quicker operational speeds, reduced shutter lag and full HD video recording. Low light shooting should also be improved. The pixel size is significantly larger than those on the G16 for better light pick up. On the back of the camera is a three inch LCD screen, which is now touch sensitive. Whereas the G1X's screen was fully articulated, Canon has taken the decision to make it tilting for a sleeker overall body size. It tilts downwards and also all the way forwards which is useful for self-portraits. Canon has also decided to remove the optical viewfinder. This isn't a massive deal as it wasn't a viewfinder with a lot of fans as, although it had optics, it was basically just a hole in the top of the camera and not as useful as the type of finder a DSLR has. Instead, Canon has developed an electronic viewfinder which can be purchased separately if you want one. It's becoming pretty standard now, so it's pleasing to see Wi-Fi and NFC technology included in this camera. Canon has also updated its free CanonWindow app for iOS and Android so that remote shooting is finally available. As already mentioned, the G1X takes on the Sony RX100 II in the premium compact market, but it also arguably takes on the smaller compact system cameras, such as the Panasonic GM1, Nikon 1 series and the Samsung NX Mini. It's also worth considering Canon's other range of G series compacts, including the G16. As it has such a large sensor, it also makes sense to pitch it against the Fuji X100S, which uses an APS-C sized sensor (slightly larger than the G1X II's device), and a fixed lens. The G1X II has a better appearance than its predecessor, not only having a more modern appearance, but also seeming to have a higher quality. It's much heavier, and a lot bulkier, than some of the high-end compact cameras on the market, so you're not likely to be able to fit this into a trouser pocket – it should find a suitable home in a jacket pocket or bag though. Its heaviness also means that you'll probably want to support it with a second hand when shooting, rather than holding it one-handed. In Australia and USA, the camera will not ship as standard with a grip on the side of the camera, though European models will. I used the European version of the camera and find it very comfortable to hold and use, it's a fairly pronounced grip which helps the camera to sit very comfortably in the hand. One of the most useful features of the Canon S120 is its customisable ring around the lens for changing certain parameters. Fans of that type of control will be pleased to know that the G1X II features two such rings, which can both be customised to a particular function. You might for instance want to set one to aperture and another to shutter speed. Unfortunately, you can't set the rings to any function you want to use – for instance, while shooting in aperture priority, the smaller ring can only control aperture or exposure compensation. Never the less, it's a useful way of working. On top of the camera is a mode dial for switching quickly between the various modes on offer, such as fully automatic and semi-automatic modes (aperture priority and shutter priority). There's also space here for up to two groups of custom settings – a useful addition if you're often shooting one particular type of scene. A good proportion of the back of the camera is taken up by the three inch touchscreen. It is joined by the standard four way navigational pad – if you've ever used a Canon compact before you'll certainly be at home here. The touchscreen is a capacitive device, just like those you would find on an iPhone, and is very easy and intuitive. You can set the autofocus point using it, as well as using it to swipe through played back images. 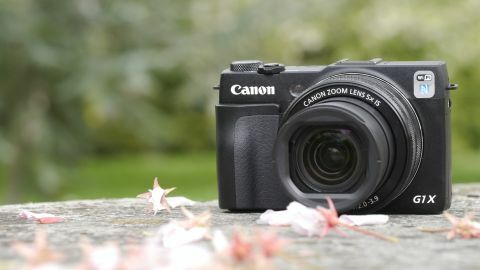 It's nice to see Canon including a touch sensitive screen on a camera which is so squarely aimed at enthusiasts – something which some other manufacturers seem to think is not welcomed by anybody but beginners. Pressing the function/set button in the middle of the navigational four way pad brings up a sort of quick menu which gives you access to most of the commonly used settings, such as white balance, image aspect ratio and timer. All of the directional keys around the navigation pad also have a function too – for instance, left accesses macro focusing, while down accesses sensitivity settings. There is also a customisable 'shortcut' key just to the right of the thumb grip – you can assign one of 24 different settings, including timer, aspect ratio, raw and jpeg shooting. Two different modes are available for the creative type, first of all there's Creative Shot, which will apply five different random effects to an image and save them all – along with a clean version of the image. There's also a filters mode which allows you to choose one particular settings, such as Poster Effect. While you have more control, you won't be able to save a clean (raw format) version of the image should you need it down the line. A dedicated button is available for accessing Wi-Fi functionality. It's great that Canon has finally updated its app to give remote shooting. You can't control a lot from the app itself, you'll need to do all of that before setting up the remote link, which is a bit of a shame, but perhaps it's something that will be improved with app or firmware updates further down the line. Either way, it's good to have the ability to do this at all, rather than just the means to send images and videos to other devices as before.